Globus has taken their 30 years of experience in producing world-class equipment to new heights with the robotic Kineo system. The Kineo provides a revolutionary way to train and test physical performance, providing priceless information for physical therapy rehabilitation. Globus has created a machine that gives the user biphasic load access, allowing them the opportunity to work in both eccentric and concentric movement phases. 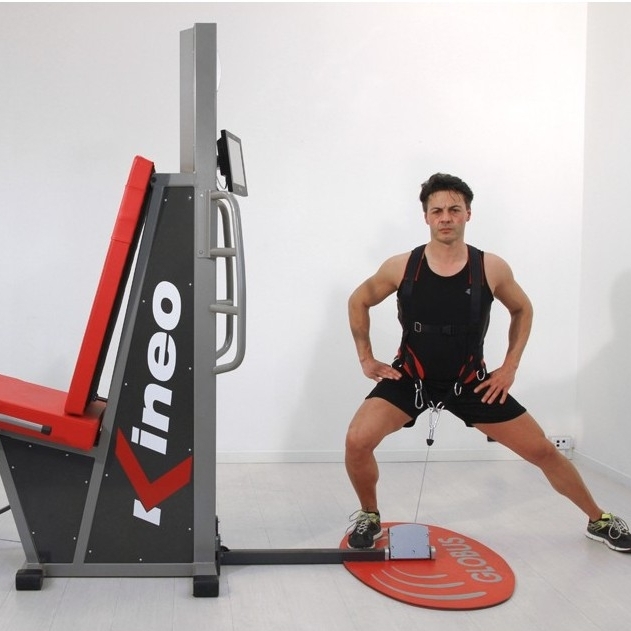 The Kineo provides feedback in isometric, dynamic, isokinetic, and eccentric movements. These test results offer invaluable baselines for the physical therapy team at Sloane Stecker as they design both rehabilitation and training programs for clients. The Kineo offers a variable load, offering the user differing resistances at all angles of the movement based on their strength levels. The load smoothly and seamlessly lowers at closed angles and increases at more open angles. The only robotic system that allows biphasic load differentiation, the Kineo optimizes training by challenging the user in every movement of the exercise. The Kineo offers training at supermaximal load, safely and effectively challenging the user in all phases of movement. Giving physical therapists the opportunity to change loads at every angle challenges clients to gain strength and mobility safely and efficiently.